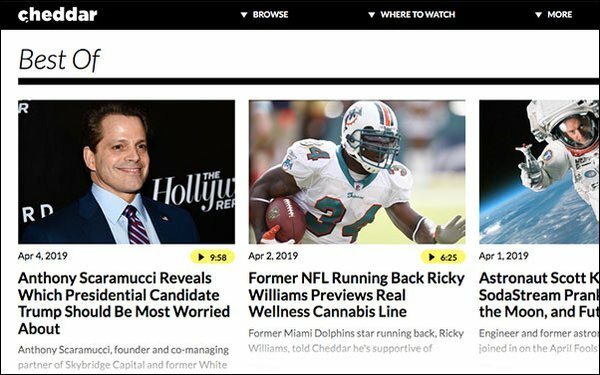 Cheddar and Local Now, The Weather Channel’s over-the-top streaming service, have enlarged their content partnership. Meteorologist forecasts will now air on Cheddar News, the streaming network's general news division. Cheddar will continue to provide daily business updates to Local Now, which delivers real-time, localized information about current events, weather, lifestyle, sports, business and traffic to 230 markets across the U.S.
Also, “Wake Up With Cheddar,” the new morning show from Cheddar's innovation and technology network, Cheddar Business, will air segments from Pattern, The Weather Group’s new, mobile-first brand. Pattern delivers video content made for Twitter, with weather and climate updates and weather science explainers. It also spotlights interesting and beautiful destinations created by weather, such as hail-covered dunes in Saudi Arabia. “It’s important for The Weather Channel to continue to super-serve our audience by finding new ways to deliver weather, news and information everywhere viewers consume content,” stated Tom O’Brien, president of The Weather Channel television network and Local Now. Cheddar is now available on a variety of platforms, including Sling TV, DirecTV NOW, Hulu, YouTube TV, Sony PlayStation Vue, Snapchat, fuboTV, Philo, Amazon, Twitch, Facebook and 60% of smart TVs in the U.S., per the company. Local Now is available on Sling TV, YouTube TV, MobiTV, fuboTV and other major OTT platforms. It is also available in the iOS, Android, Roku and Amazon Fire app stores, as well as desktop.